It’s time to mark your calendars. This year, the MPA heads west to Sunday River Resort in Newry for the MPA Annual Conference, to be held on Saturday, October 20. Planning will begin soon for the Conference which includes informative and interactive sessions, idea sharing, networking, the Hall of Fame Induction Luncheon, Scholarship Auction, and Awards Dinner & Banquet. BAR HARBOR – The Portland Press Herald, the Mount Desert Islander of Bar Harbor, the York Weekly and the Maine SundayTelegram have been honored by the Maine Press Association for General Excellence in print newspapers. The Bangor Daily News, The Ellsworth American and Boothbay Register took top honors for digital General Excellence in the MPA’s Better Newspaper Contest. The awards were presented Saturday night at the Atlantic Oceanside Hotel & Event Center in Bar Harbor, concluding a day of workshops for journalists, advertising staff and newsroom managers throughout the state. 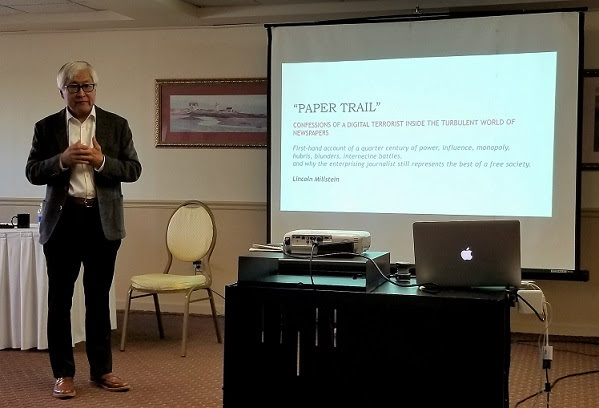 Lincoln Millstein, Senior Vice President of Hearst Newspapers, was the featured conference speaker and shared his views on the future of newspapers and why ‘digital first’ won’t deliver. 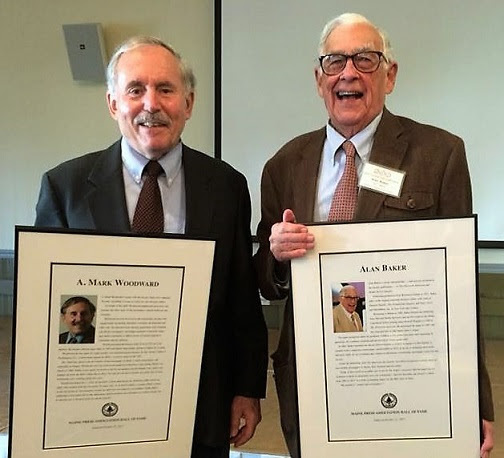 Earlier in the day, the association inducted two new members to its Hall of Fame: Mark Woodward, former executive editor of the Bangor Daily News, and Alan Baker, longtime owner and publisher of The Ellsworth American and Mount Desert Islander. In the General Excellence competition for print newspapers, the Portland Press Herald was judged the best daily in Maine while the Maine Sunday Telegram was the weekend Newspaper of the Year for the seventh time in eight years. Lincoln Millstein, Senior Vice President of Hearst Newspapers, was the featured speaker at the Maine Press Association’s 2017 Fall Conference. The Mount Desert Islander has been named Newspaper of the Year 11 times since 2006 – six times in the Weekly 1 division and five years in Weekly 2 (4,000 and over circulation). The Courier-Gazette won the Freedom of Information first-place award in the weekly category, while the Sun Journal took top honors in the daily/weekend division. Matthew Stone of the Bangor Daily News was named the Journalist of the Year while Carla McGuire of the Kennebec Journal was the Advertising Person of the Year. Maia Zewert of the Lincoln County News won the Bob Drake Young Writer’s Award, and Robert Long of the Bangor Daily News was honored by the MPA as the Unsung Hero of the Year. Mark Woodward, left, and Alan Baker, this year’s Maine Press Association Hall of Fame inductees. Join members of the Maine Press Association as they gather at Atlantic Oceanside Hotel & Event Center in Bar Harbor on October 21 to exchange ideas and celebrate the year’s achievements. A full day of workshops, including a general session with guest speaker Lincoln Millstein of Hearst, has been organized. Hear from a panel of actual advertisers about why they advertise and what they need to be successful, participate in a discussion about media bias and how newspapers can protect their brand (of good, quality journalism), and gain tips and information about management that will be useful across all departments. The day begins at 8:30 a.m. with the Annual Business Meeting, when the new slate of 2017-2018 MPA officers and board members will be voted in. Morning sessions will run from 9:15 a.m. to 12:15 p.m. followed by lunch and the induction of Mark Woodward and Alan Baker into the MPA Hall of Fame at 12:30 p.m. Our final session is in the afternoon from 2:15 p.m. to 3:30 p.m.
Auctioneer Extraordinaire Earl Brechlin will reprise his role—possibly for the last time—at the Scholarship Auction & Reception at 5:30 p.m., followed by the 2017 Better Newspaper Contest Awards Dinner & Banquet. The Conference registration deadline was Oct. 2. For further information about the conference or registration, please contact MPA Executive Director Diane Norton at mainepressmail@gmail.com or via phone at 691-0131. Join members of the Maine Press Association as they gather at Atlantic Oceanside Hotel & Event Center in Bar Harbor on October 21 to exchange ideas and celebrate the year’s achievements. A full day of workshops, including as a general session with guest speaker Lincoln Millstein of Hearst has been organized. Hear from a panel of actual advertisers about why they advertise and what they need to be successful, participate in a discussion about media bias and how newspapers can protect their brand (of good, quality journalism), and gain tips and information about management that will be useful across all departments. Lincoln Millstein, Senior Vice President of Hearst, will share his views on the future of newspapers at a General Session at the annual Fall Conference. Don’t let his digital background fool you, Lincoln is bullish on the future of print and he will tell you why. Get a preview of Lincoln’s thoughts on the future of newspapers by reading the first chapter of a book he is writing on the topic. His talk is for every MPA member whether on the business side or in the newsroom. You won’t want to miss this. Lincoln was a digital executive at the New York Times Company before joining Hearst. He was the founder of Boston.com and a former business editor at The Boston Globe. He and his wife Irene vacation on MDI each summer and he is delighted to join us in Bar Harbor. Is ‘fake news’ hurting journalism? Do we really mean to say bias when we say ‘fake’? How should media organizations respond and what can they do to keep their brand in tact? Explore the basic tenants of journalism with a panel of guests that will talk about what newspaper organizations can do to promote and support their work, especially when it comes under attack. You sell advertising. But, have you thought about why people buy it? We have invited a group of advertisers to show you another side of the process—their side. They will take your questions and give insight into how to strengthen relationships in your community. Newsrooms are stressful, Ad Departments are stressful, heck, all departments are stressful—that’s the business we’re in. In light of that constant grind, how do you still motivate staff on a regular basis? How do you deal with difficult personalities? How do you manage being an intermediary between the staff and ownership? Hear about ways to build your human resources knowledge and hopefully make a happier staff. The MPA’s Annual Fall Conference will be held on Oct. 21 at Atlantic Oceanside Hotel & Event Center in Bar Harbor. The Maine Press Association’s Annual Fall Conference will be held this year on October 21, 2017, at the Atlantic Oceanside Hotel & Event Center in Bar Harbor. A full day of conference events is planned, including the Hall of Fame Inductee Luncheon, annual Scholarship Auction, and the 2017 Better Newspaper Contest Awards Dinner & Banquet. Contest judges have been jamming the MPA Office with packages, decisions and wonderful comments. We hope to have the majority of decisions sorted, reviewed and ready to share with members in the next ten days. As always, we’ve negotiated a great hotel rate for the nights of Oct. 20-21 for MPA members and guests at Atlantic Oceanside. All MPA rooms have a single king or two queen beds and are in the Main Hotel. The nightly rate is $139. Guests can make hotel reservations by booking directly online at www.AOBarHarbor.com (BOOK NOW) and using the MPA Group Code 27348, or by calling the Atlantic Oceanside reservation line at 800-336-2463 and referencing Maine Press Association. Reservation deadline is September 20, 2017. While the hotel will honor the MPA group rate after the reservation deadline, they cannot guarantee room availability. You can find Conference Registration information and a registration form on the MPA website (look for 2017 Fall Conference tab) or by clicking here. Conference registration deadline is Monday, October 2. The Maine Press Association’s Annual Fall Conference will be held this year on October 21 at the Atlantic Oceanside Hotel & Event Center in Bar Harbor. A full day of conference events is planned, including the Hall of Fame Inductee Luncheon, annual Scholarship Auction, and the 2017 Better Newspaper Contest Awards Dinner & Banquet. And what about those awards? Judges are being mindful of this week’s deadline for decisions and comments, and have been overwhelming the MPA Office with packages, decisions and wonderful comments. We hope to have the majority of decisions sorted, reviewed and ready to share with members in the next two weeks. As always, we’ve negotiated a great hotel rate for the nights of Oct. 20-21 for MPA members and guests at Atlantic Oceanside. All rooms held for us have a single king or two queen beds and are in the Main Hotel. The nightly rate is $139. In the meantime, be on the lookout next week for registration information as well as details about this year’s program and sessions. A former executive editor of the Bangor Daily News and the longtime owner and publisher of two of Maine’s top weekly newspapers will enter the Maine Press Association Hall of Fame in October. Mark Woodward and Alan Baker were selected this month by the MPA’s Hall of Fame Committee. They will be inducted Oct. 21 during the association’s annual Fall Conference at the Atlantic Oceanside in Bar Harbor. Woodward’s career with the Bangor Daily News spanned 38 years, including 12 in which he was executive editor. As he led the news staff, he emphasized local news and oversaw the early years of the paper’s digital platforms and coverage. He also emphasized community involvement, serving with organizations promoting education, economic development and elder care. He launched story-sharing agreements with Canadian and other Maine newspapers, and helped to establish a statewide courts and media committee, to resolve issues of mutual concern to journalists and the judiciary. Woodward joined the Bangor Daily News in 1971 as a city reporter. He became editorial page editor in 1982 and helped shape public opinion in Maine for 15 years. He left the paper for eight months to be communications director for Sen. Susan Collins in Washington, D.C., in 1997. He was named executive editor in the fall of that year. Woodward always valued the special role of a family-owned newspaper in Maine’s small communities, and especially in Bangor. Baker, owner and publisher of The Ellsworth American and the Mount Desert Islander, is known for his fervent belief that newspapers should be owned by individuals who are available and accountable to the communities they serve. He has been a strong supporter of public notice and right-to-know laws in Maine, and has not hesitated to back up his papers’ insistence on openness by suing to prevent government officials from keeping the public’s work secret. A native of Orrington, Baker joined James Russell Wiggins at the American in 1986. He bought the paper from Wiggins in 1991 and remained true to the famed editor’s legacy. The paper prospered under his guidance, expanding its operations and modernizing its printing plant. The number of employees doubled, advertising revenue quadrupled and the paper began publishing award-winning special sections and supplements. In 2001, Baker launched the Mount Desert Islander, a weekly in Bar Harbor that competed with a long-established, corporate-owned paper, which folded in 2012. He understood, in an era of shrinking news holes and news staffs, that content would ensure a community newspaper’s survival and success. The Islander and the American have been recognized multiple times as the best weekly papers in Maine, New England and even the nation. Tickets to the Hall of Fame luncheon are available by contacting MPA Executive Director Diane Norton at mainepressmail@gmail.com or 691-0131. Nominations are being taken for 2017 inductees to the Maine Press Association Hall of Fame. The deadline for nominations is Friday, July 7. Candidates must be Maine newspaper professionals who made lasting career contributions to their craft, in or out of the state. Typically, some of each year’s Hall of Fame class is inducted posthumously. The MPA’s Hall of Fame Committee asks that nominations be submitted as soon as possible so they can be circulated among the committee members who will select the inductees. Each nomination should be accompanied by supporting material that will help committee members as they make their decisions. Questions may be directed to Jeff Ham or to Executive Director Diane Norton at mainepressmail@gmail.com. The 20th annual induction ceremony will be held Oct. 21 at the MPA Fall Conference in Bar Harbor.